Kittens and puppies and Guinea Pigs…oh my! On Saturday, June 8 - Just One Day - Chicago Party Animals will be the spot to be for an adoption event featuring cats and dogs of all ages and all kinds of other critters. Over a dozen animal rescue groups will be at Chicago Party Animals for the Just One Day Adoption Event. 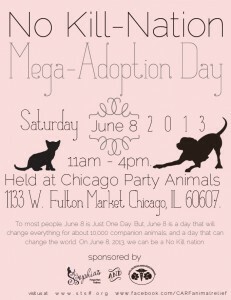 Chicago animal rescue organizations big and small will be joining forces for the Just One Day adoption event. It ties in with a national event slated for Tuesday, June 11 aimed at shining the light on the large number of animals needless killed at animal shelters and animal control facilities each day. St. Sophia's has partnered with CARF (Critical Animal Relief Fund) to host the event with around a dozen groups already pledging to participate. Chicago’s largest no kill shelter – PAWS – and the oldest, largest, cageless no-kill cat shelter – Tree House Humane Society – are just two of the groups that are participating with the smaller rescues at the Just One Day event. Timing of the national event, and local initiative, is critical. Currently, the kittens and puppies born in March and April are flooding animal control and the shelter system. And, CACC and suburban animal controls are filled to capacity with pets dumped because it’s moving season. 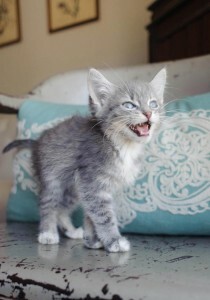 It's kitten season and shelters are overflowing with kittens. 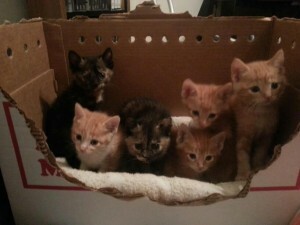 CARF rescued this group earlier this spring. There also is a large number of kittens and friendly stray adult cats pulled in through Trap Neuter Return (TNR) efforts in Chicago, flooding local rescues. June is already National Adopt a Shelter Cat month in an effort to spotlight the need for cat adoption as well. Adoptions tend to go down in the summer with people vacationing during a time when animals most need rescue. Slinky says Just One Day is a great day to adopt a pet. He's already found a home through St. Sophia's Forgotten Felines. All of these Chicago groups are No Kill every day of the year. 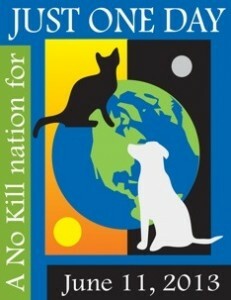 Last year, over 800 no kill and open admission shelters (those that euthanize for space) participated. This year, over 1,100 groups have signed up so far and the goal is to have 1,500 groups on board to save 15,000 lives. This event will be for adoptions only with no selling of merchandise permitted. Learn more about the Just One Day event online and if you'd like to register your group, learn more here. To subscribe to my feed, type your email address in the box and click the "create subscription" button. My list is completely spam free, and you can opt out at any time. Email story ideas to me at kathypetexam@gmail.com an like my Raining Cats & Dogs Facebook page or follow me on Twitter.